The silhouette stood at the edge of the woods like a spider watching a fly enter its carefully crafted web. Only a few more steps and she’d be within its grasp. Stacy Shaw has her whole life ahead of her. New job, new house and now a baby on the way—everything she’s ever hoped for is finally coming true. But on a warm summer night on the way home from work, she vanishes. The police race to find her, but the clues don’t add up. Conflicting facts emerge as her story twists and turns, sending the trail spiraling in all directions. A hometown hero with a heart of gold, Jack Stratton was raised in a whorehouse by his prostitute mother. Jack seemed destined to become another statistic, but now his life has taken a turn for the better. Determined to escape his past, he's headed for a career in law enforcement. When his foster mother asks him to look into the girl’s disappearance, Jack quickly gets drawn into a baffling mystery. As Jack digs deeper, everyone becomes a suspect—including himself. Caught between the criminals and the cops, can Jack discover the truth in time to save the girl? Or will he become the next victim? 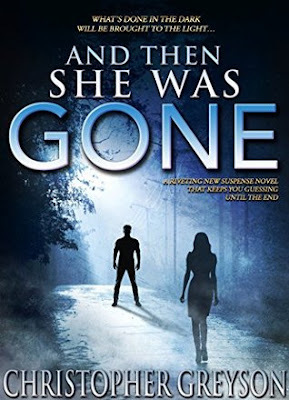 And Then She Was Gone is part of the Detective Jack Stratton Mystery Series. This was my first Christopher Greyson book, and I very much enjoyed it. I was worried when I realized it was a series, but And Then She Was Gone is a prequel; so not only did that work out perfectly, but I also discovered that all the books in this series can be read as stand-alones, which I love. No pressure to get the exact order – though those who know me know that from here on out, I will go in the order published because… well, I’m me. In this prequel, Jack Stratton is not yet the detective he will be in novels of the rest of the series. In And Then She Was Gone, Jack and his foster brother Chandler are two teens who are navigating their way through their senior year, have already enlisted in the army, and have their futures impressively planned out. After the army, Jack plans to go to college and then attend the police academy – his dream since he was just a child. Jack’s childhood is heartbreaking, but the love he found in his foster family with Chandler and Aunt Haddie and later with his adoptive parents is heartwarming and hopeful. When a boy from his foster family’s neighborhood is arrested in the disappearance of a young woman, Jack is pulled in and, much to the chagrin of detectives working the case, begins an investigation of his own. I love that this book is suspenseful and full of mystery but is also a very clean read. I can give this not only to my teen who has recently started getting into the mystery genre but to my mom as well (who is a strictly PG audience). They will both love it! There are little inspirational moments cleverly tucked into conversations that I know they will appreciate, and I couldn’t help but smile at those little touches. If the present Detective Jack Stratton is half as endearing as young detective-wannabe Jack Stratton, then I’m sold and can’t wait to get started on the rest of this engaging series. I love that this one was clean...even as an adult sometimes that's what I'm looking for...especially in mysteries where things can get too graphic. Glad this worked for you and that you started at the beginning.. This sounds like a terrific mystery. I too appreciate that it is clean because as much as I love a good thriller, I hate when they get too dark and icky. Happy Halloween lovely lady. Oh this is for sure a Wifey read and I giggled at the "well I'm me" because yes I know your need to read in order well. Great review Wifey cakes!